One of the hardest things about sewing for boys is the lack of variety. There's just so more choice when it comes to patterns and fabrics for girls. Having said that though, there's a lot of brilliant stuff out there and I can usually find inspiration on other blogs or Flickr. 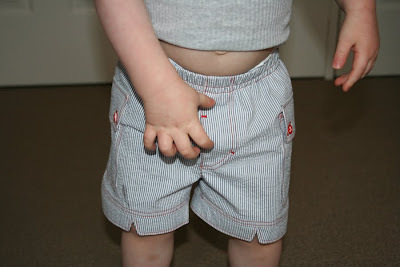 I'm still trying to get most of my Summer sewing done and that includes lots of shorts for my little guy, who wears little else over Summer. I have a few patterns, but am reluctant to buy more as they're all just variations on a theme. That's why I like Ottobre magazine so much, lots of boy patterns every issue that I probably wouldn't purchase individually, but really appreciate. These shorts are from Ottobre 3/11. I like the way they're a bit shorter than most of the other patterns out there, and the little cuff detail is something a bit different (to be honest I wasn't sure about it, but was itching to do something 'new', and I really like the end result). This is only my second Ottobre attempt. On one hand it's kind of refreshing to have minimal instructions - there's certainly no hand-holding! On the other hand the finish isn't quite as polished as you'd get with say an Oliver + S pattern. I learnt a few new tricks making these though - constructing the waistband without having to thread through elastic on a safety pin was a revelation... sooooo much easier than the way I usually do it! 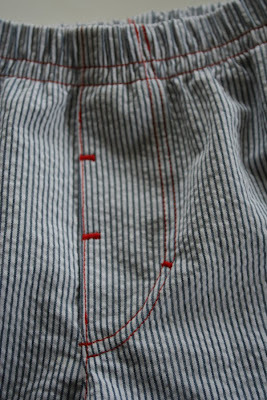 I sewed them in navy and white seersucker with red topstitching. There's a lot of topstitching in this pattern - two rows on most seams. I love topstitching though, although using such an obvious colour made me a bit more cautious than usual. 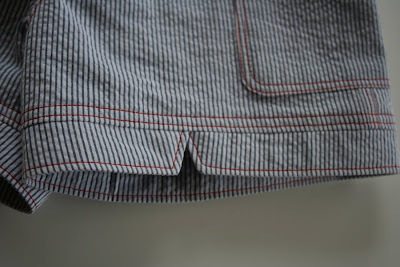 The seersucker was from my stash (leftover from this shirt) - if I had purchased fabric for these I would have gone with a broader stripe, but I'm trying to chew through my fabric stash at the moment. I made these in a 92 and they fit beautifully on my big, little boy. 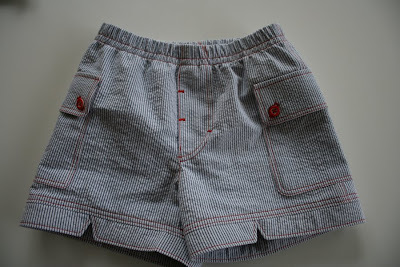 The finished shorts. 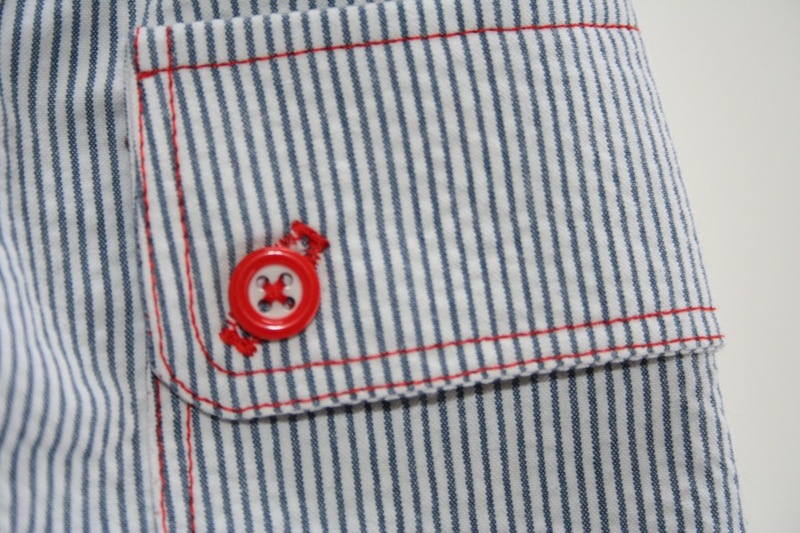 They've got patch pockets with a little flap, faux fly and a little crossover cuff detail. *sigh*. This is the best photo I could get of my little guy wearing them. You are growing up too fast mister. Cuff detail. Didn't like this initially but do now. Pocket detail. 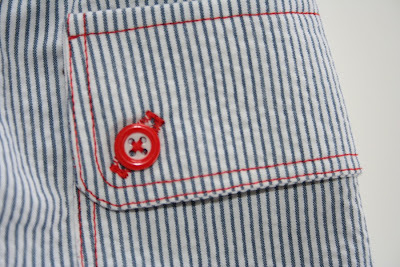 I like the diagonal buttonholes, and chose red and white contrast buttons. Your top stitching is perfect! Did you use topstitching thread? Great job!